[June, 2017] I had this during a "Laddie" tasting of the FoSM at Bonn. This distillation was part of the experimental work at Bruichladdich distillery when they tried to find new whisky tastes and unusual flavour profiles. While other work from that phase became an integral part of the whisky industry today (like the red wine or sweet wine maturations or the heavily peated stuff known as Octomore) this quadruple distillation was never repeated. Guess why? Simply because the result is almost flavourless (this was not really a surprice, wasn't it Jim?). You better drink a bottle of premium vodka that is smoother and much, much cheaper. As an experiment this is fine, but I do not understand comments like "it is good to see how a Laddie new make tastes". This is NOT a Laddie new make as all Bruichladdich whiskies are just double distilled (and not quadruple like this one). Hence the real Laddie new make owns much, much more flavours and aromas than this one. It's not whiskey, but a wild mixture of grappa and William pear. Smelled very moldy in the beginning, after a few months rather fresh after sea air. No whiskey, but a very interesting experience. If you like Bruichladdich, you have to try it ... it's best to "rinse" the glass with hot water and then fill in the X4. That's how it unfolds right! and notes of sweet potato. Palate: Very spirit forward like poteen with a nuttiness that becomes more jammy with water. Finish: Very hot, spirity and clean with a longer finish than would be expected for this style of drink. Overall: A true accomplishment in how far a pot still can be pushed. Can not understand the many extremely bad reviews here. Of course, this is NOT a whiskey, as such, he was not sold. It is simply the fourfold-distilled "New Spirit" by Bruichladdich, which was diluted to 50% vol. Without any cask storage, every comparison to a whiskey is forbidden. 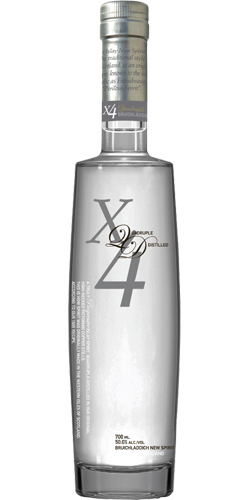 The X4 is for a New Spirit extremely soft and pleasant, just slightly warmed surprisingly delicious. The 4-fold distillation makes it very soft and mild, downright dangerously tasty. A nice way to get an idea of ​​the origin of each Bruichladdich. Compared to other New Spirits, which I was able to taste so far, this is actually drinkable. spirity. The finish is short and smooth. than the whisky drinker. Not for me.